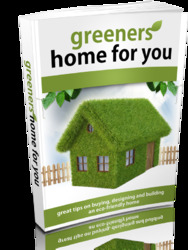 This chapter shows how to use Eurocode 21 with the other Eurocodes. In particular it introduces Eurocode: Basis of structural design2 and Eurocode 1: Actions on structures3 and guides the designer through the process of determining the design values for actions on a structure. It also gives a brief overview of the significant differences between the Eurocodes and BS 81104, (which will be superseded) and includes a glossary of Eurocode terminology. 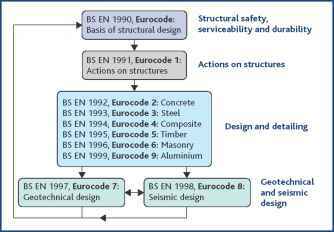 The development of the Eurocodes started in 1975; since then they have evolved significantly and are now claimed to be the most technically advanced structural codes in the world. 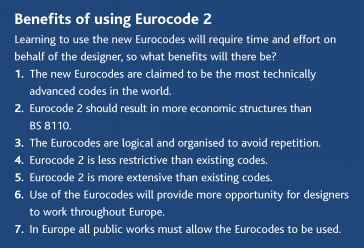 The many benefits of using Eurocode 2 are summarised below. 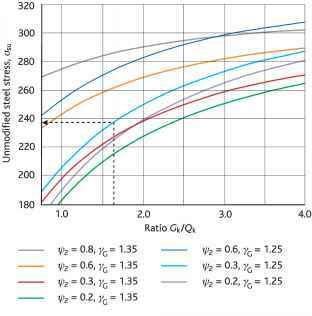 There are ten Eurocodes covering all the main structural materials (see Figure 1).They are produced by the European Committee for Standardization (CEN), and will replace existing national standards in 28 countries. Each country is required to publish a Eurocode with a national title page and forward but the original text of the Eurocode must appear as produced by CEN as the main body of the document. A National Annex (NA) can be included at the back of the document (see Figure 2). Throughout this publication it is assumed that the UK National Annexes will be used. Table 1 details which existing standards relating to concrete design will be replaced by the new Eurocodes. During the implementation period it is recommended that existing standards are considered for use where the European standards have not yet been issued.